Greetings Gaia subscribers and welcome to our bumper newsletter for the end of 2018. For those of you embarking on your travels, perhaps to see loved ones far away (my son is in the USA) or for those travelling locally, we highlight our handy travel size packs featured below. Full of hand crafted surprises! One of the very best things that we have been blessed with is staff with integrity and longevity. 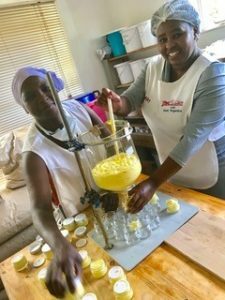 Pictured here are staff members Cindy (left) and Ally (right) decanting a batch of cell regenerating cream. The yellowish colour is derived from Vitamin B2 which is a great ingredient to use for the regeneration of dermal cells. 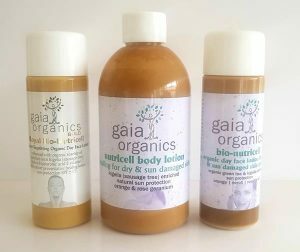 Our facial creams all contain Vitamin B2, B6, Vitamin C & Vitamin E.
Gold range creams such as Pigment Controlling Night cream contains Tumeric (curcumin) and Ultra Rich Pro-Biotic is rich in Rosehip & Kalahari Melon seed oils. I know we’ve spoken about this before but I cannot re-emphasise the results we have encountered by these products, totally unique to us. The Nutricells – what is the difference? 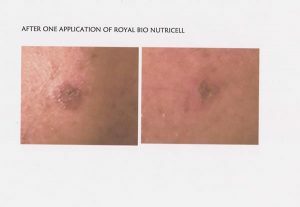 The Royal Bio-Nutricell (Gold) added Kigelia for sun damage, added Jojoba, added Kalahari Melon Seed oil. Bio-Nutricell (Green), slightly less rich in nutritive oils but the same formulation and more suitable for skin that is not as dry and dehydrated. Nutricell Body Lotion which is a slightly diluted version of the two for use over the whole body particularly arms and legs that have endured many fishing trips, outdoor activities (golfers) and general over exposure to the sun. The complex formulation and processes of manufacture that are followed when producing these three products results in a lotion that is truly unsurpassed by any off the shelf product available worldwide. This is a real before and after of a solar keratosis growth that was burnt by a dermatologist using nitric acid. After one application of Royal BN, the scab had healed and immediately looked much better. 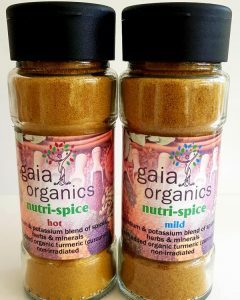 As part of our Gaia Protocol we offer the most delicious nutritional salt/spice alternative. Nutri-Spice (mild) is filled with a mixture of herbs marjoram, origano, thyme & celery seed plus spices such as paprika, turmeric & cumin. Most importantly it contains Potassium Chloride and Himalayan salt to a ratio of 3 parts potassium to 1 part sodium necessary for cellular pump health. Nutri-Spice (hot) – exactly the same mix but with added Capsicum. An essential salt and herbal replacement fit for any dinner table. The garden route is filled with many nature trails and beautiful hikes in areas such as Knysna, Plettenberg Bay and Natures Valley. ‘Slack Packing’ has become somewhat of a buzz word and we have supplied bio-degradable products to hikers and campers alike. Our travel packs consist of a sunblock, mozzie repellent, bio nutricell & body lotion. Handy 50ml sizes and lightweight for backpacks @R295 per 5 product pack. We will be closing on Thursday the 20th December and will re-open on Monday the 7th January 2019. Send a gift ! 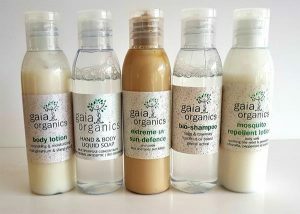 Our GIFT CARD system is live and on the website www.gaiaorganics.co.za in the event that you would like to purchase a prezzie for someone special. You will find the gift card under “Products” and follow the prompts of who you would like to send the gift card to – amounts vary from R200 upwards for you to select, the recipient will receive notification that you’ve sent them a gift ! 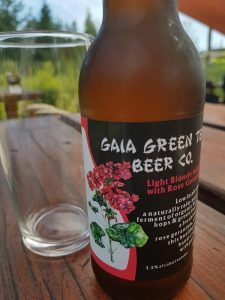 Our health beer has been officially launched, www.gaiagreenteabeer.co.za with a few local restuarants having already supported this venture of organic hops, barley and green tea. Light in taste and low in alcohol makes this a perfect summer beverage. Irish Red, malty and full bodied with a hint of ginger and the Light Blonde infused with rose geranium. Bottled in 340ml’s and selling at R35 per bottle. Our super 3 -some consisting of Magnesium Peroxide; Pure Magnesium Ascorbate and Sodium Ascorbate Vitamin C (all non GMO). 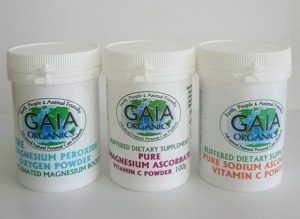 Note the difference with the 2 magnesiums a) mag peroxide – cleaning the colon with oxygen and alkalising; b) mag ascorbate – magnesium & ascorbic acid 3:1; c) sodium ascorbate – vitamin C, gentler than ascorbic acid. Seeing as it’s the start of the festive season, the magnesium peroxide powder is an essential for when you’re travelling and the colon is out of whack; and with a little holiday indulgence perhaps, the magnesium peroxide will ensure that you remain alkaline, so we are giving away a free 20g tub with every order purchased on-line. 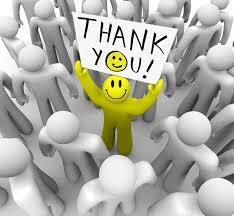 Lastly, thank you all for your support throughout the year, it is so valued and appreciated. If you are in Plettenberg Bay over the holidays remember that you are welcome to pop into no. 28 Longships Drive, if it is during our close you can call me on 082 467 0799 and arrange an appointment or alternatively find either Christell or myself at the Wild Oats Farmer’s market in Sedgefield every Saturday from 7.30am to 12 noon.